Cheap flights are hard to find during December, but if you are flexible it is possible to save a few bucks for holiday activities! Some routes are cheaper than others, with flights from Johannesburg to George, Cape Town and Durban more expensive than the return leg. This is largely due to the high demand for beach escapesr during the school holidays. Schools close on the 6th of December 2017 and as expected, flight prices increase ever so slightly from that date onward. The Day of Reconciliation (the 16th of December) is a Saturday, so no long-weekend to push flight prices up this year, but it still marks the start of many workers' annual leave and many offices close for the year. So flight prices increase drastically from that date onward. Expect to find the cheapest flights toward the beginning of the month and avoid travelling around Christmas and before New Years where possible. For more specific recommendations, see our price lists below. Kulula JHB to CPT : The first week of the month is the best time to travel. The cheapest flights are on the 3rd, 10th and the 11th. Kulula CPT to JNB : The cheapest flights are on the 14th, 19th and the 21st. Kulula Lanseria to CPT : There are slightly more affordable flights available during the first week of the month, especially on the 2nd and the 4th. Kulula CPT to Lanseria : Find affordable flights highlighted in green below and avoid travelling on the 11th where possible. 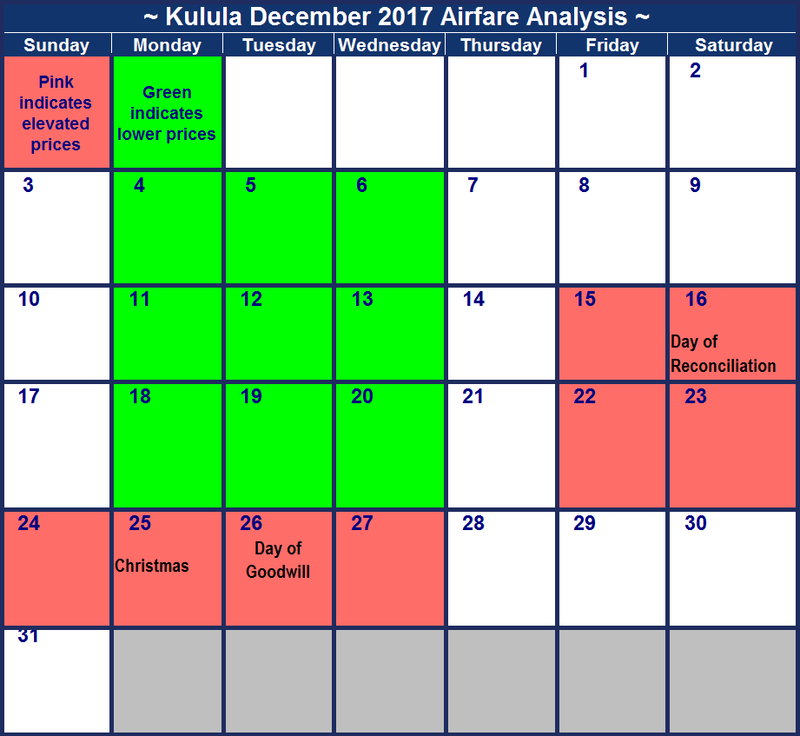 Kulula JHB to Durban : Flight prices are fairly consistent throughout the month with the only spike on the 23rd of December 2017. 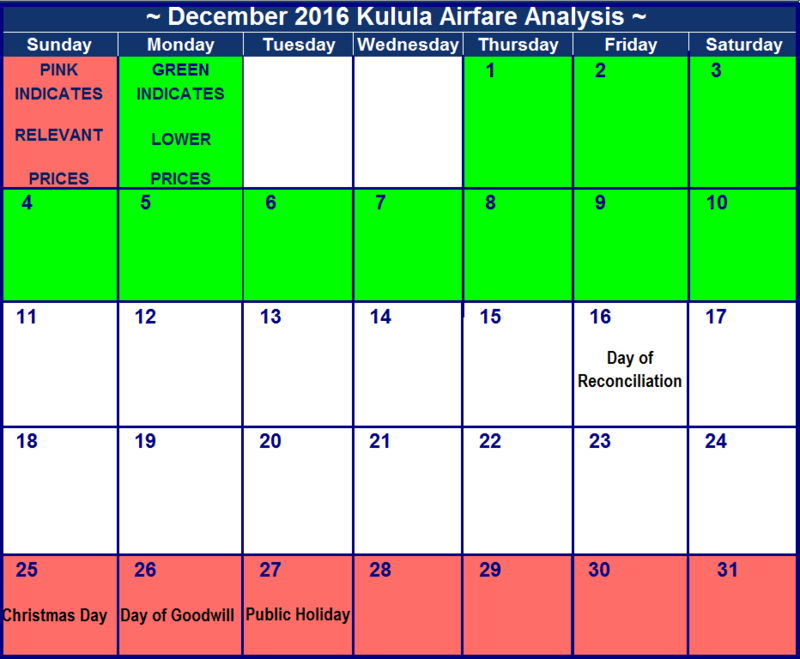 Kulula Durban to JHB: Dates highlighted in green are the cheapest to travel on and readily available throughout the month. Kulula Durban to Lanseria : There are affordable flights throughout the month, although weekend flight prices are slightly elevated. Kulula JHB to George : Flight prices on this route are very expensive compared to other routes. Grab the cheapest airfare on the 31st. Kulula George to JHB : Travel during the first three weeks and still have enough money left to enjoy the festive season. Kulula CPT to Durban : If you're careful, you could pay nearly three times the price of the cheapest airfare available on this route. Kulula Durban to CPT : Flight prices on this route are quite high. Grab the cheapest airfare on the 24th. Kulula JHB to East london : There are affordable flights throughout the month. Avoid travelling on the 16th. Kulula East London to JHB : There are affordable flights throughout the month. Avoid flying during the last week of the month. It feels like December has crawled up on us! Make the best of the festive season, whether that means beach and New Year's parties or cooked meals and family with the cheapest flights this December. With a whole host of public holidays and the start of the school holidays, affordable flights are hard to come by. Especially on busy routes (like Lanseria - Cape Town) and routes with limited flights (Johannesburg - George). School holidays start on the 7th of December 2016, but surprisingly flights haven't skyrocketed yet! Book now to secure cheap flights. Furthermore the 16th (Day of Reconciliation), 25th (Christmas Day), 26th and 27th of December 2016 are all public holidays. As a result the last two weeks of December are incredibly expensive to travel. If you are on a tight budget, in general flights to Johannesburg are fairly affordable throughout the month and if you can travel during the first week of December you'll save on most routes. Kulula JHB to CPT : Don't fly on the 10th and the 26th, as these dates are the most expensive. The first week of the month is the best time to travel. The cheapest flights are on the 1st, 4th, 5th and the 6th. Kulula CPT to JNB : There are affordable flights during the first three weeks on the month. Avoid flying on Sundays, especially the 18th and on New Year's eve. Kulula Lanseria to CPT : There are affordable flights during the first week of the month, especially on the 3rd and the 4th. No savings to be had during the school holidays. Kulula CPT to Lanseria : There are affordable flights throughout the month, especially on the 1st, 2nd, 3rd and the 4th. Kulula JHB to Durban : There are affordable flights throughout the month, especially on the 1st, 8th, 22nd and the 29th. Avoid travelling on the 24th. Kulula Durban to JHB: There are affordable flights throughout the month, with not much of a difference between the cheapest and most expensive. The cheapest flights are on the 1st, 3rd, 4th, 8th, 15th and the 22nd. Kulula Lanseria to Durban : There are affordable flights throughout the month. The most expensive flights are priced the same on the 9th, 10th, 15th, 16th, 17th, 18th, 19th, 23rd, 24th, 26th and the 27th. Kulula Durban to Lanseria : There are affordable flights throughout the month, except for the last six days of the month. Kulula JHB to George : Flight prices on this route are quite high compared to other routes. Grab the cheapest airfare on the 4th. Kulula CPT to Durban : Make the best of your budget by travelling on the 1st, 5th, 6th, 7th, 8th, 9th, 14th and the 20th. Kulula Durban to CPT : Flights prices from the middle to end of the month are quite high. The most affordable dates would be on the 2nd, 3rd, 4th and the 14th. Kulula JHB to East london : There are affordable flights throughout the month. Avoid travelling on the 15th and the 18th. Kulula East London to JHB : There are affordable flights throughout the month, with not much of a difference between the cheapest and most expensive. We haven't gotten around to surveying prices for the last month of the year yet, but we hope to get to it soon! Please consult last year's prices below to get an idea of what you can expect this year. Kulula JHB to CPT : Don't fly on the 13th, the 20th and the 27th, as these dates are the most expensive. Kulula CPT to JNB : Try to aim for the 14th, which has the lowest price. Kulula Lanseria to CPT : Prices during the first week of December are lower than in the remaining weeks, so try to pick a flight on one of the earlier dates. Kulula CPT to Lanseria : Aim for a departure date before the 26th of December, as prices are quite high from then onwards. Kulula JHB to Durban :The 7th, 12th and 14th have the lowest prices, so try to pick one of these dates. School holidays commence on the 10th. Kulula Durban to JHB: Aim for either the 12th, 14th of 26th, as these dates are the most affordable. Kulula Lanseria to Durban : Flights that depart on the 10th, 11th and 23rd are the most expensive. The cheapest flights depart on the 30th and 31st. Kulula Durban to Lanseria :The Day of Goodwill seems to apply to flights as well, as flights on this date are quite affordable. The 30th and 31st follow suit. Kulula JHB to George : Flights prices on this route are quite high compared to other routes, but the 10th stands out as the most expensive, due to the start of the December school holidays. 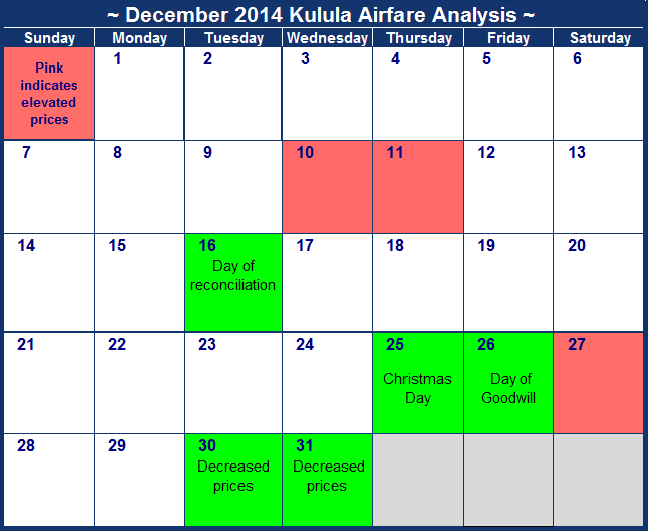 Kulula George to JHB : Don't pick a flight on any of the dates during the final week of December. Kulula CPT to Durban : The best dates to pick a flight on would be during the first week of December. Kulula Durban to CPT : Flights prices on the 27th are quite high. Kulula JHB to East london : Flights prices on this route are quite high in comparison to other flight routes. But try to pick a date during either the first or final weeks of December. Kulula East London to JHB : This route continues the trend set by JHB to East London, as all of the prices are the same. By the way, if you're looking for something extra special to do in December, check out this Kulula party cruise package. The airfares listed below are the cheapest we could find on each day in December 2014, when we set this up. This survey was performed on the the 22nd of September 2014 - the longer the amount of time that has passed since we set it up, the greater the probability that airfares have changed. Current airfares can be found at at Kulula.com.